Picking the right hotel at the right location, can make all the difference for you and your family when planning a vacation in San Juan, Puerto Rico. On this page we provide you with a general map of hotels, resorts and small inns only located on the tourist districts of San Juan and nearby Isla Verde (15 minutes east of San Juan). Using popular booking sites can sometimes be tricky since they also show you “nearby” hotels which may not be the most convenient locations when you really want to experience the capital city of San Juan, Puerto Rico. Below we have also provided more detailed hotel maps by tourist districts for those that have decided on a specific destination. 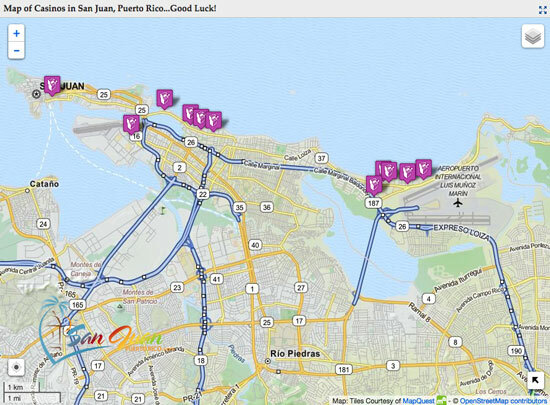 You may also be interested in seeing the Map of Hotels & Resorts near the San Juan International Airport.